So I think I have discovered the secret to getting fresh eggs year-round. It’s a simple one: always have enough young pullets around to lay them! You see, chickens need about 14 hours of light a day to encourage them to lay: anything less than that, they’re saving their reserves for other worthwhile ventures, like keeping themselves warm. Our older girls will give us an egg maybe every three days, but four of the five youngsters will lay just about daily. It’s a lot of eggs: more than we can eat, quite frankly. But: we have egg-loving friends, family and employers…. We do have one warming light in their coop. (Yes, sue me; but remember, our electricity is Nookeelar, as our esteemed president calls it: a carbon neutral but not guilt neutral power source. 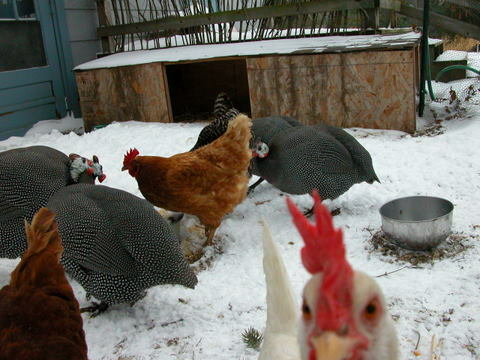 And I do feel guilty about the expenditure, but rather happier that I have happy chickens.) It’s on a timer, and gives them about 4 hours of light at night. It’s cold out, so they spend most of their days all huddled up in the chicken condo (different, certainly, from the chicken coop: this is just their day house) shown in the picture above. It keeps them out of the wind, but I would think it would be kind of crowded with eleven of them in there. Ah, well, birds of a feather: they do flock together! a couple of years ago I was surprised to learn that chickens were the decorative rage in urban gardens; one gardener referred to them as her “garden jewels.” Looking at this picture it’s easy to understand why. I saw one gardener in zone 5 that uses plastic hoops to keep an area of bare soil for the chickens so they can scratch – she said it rarely freezes under the plastic. Curious: have you ever tried that? Do you think it makes practical sense? Are the guineas much for making alot of noise? I’ve heard they can make a racket but have never been around them. Yeah! More chicken photos! They’re beautiful! I love the guinea hens. We’re getting closer. The builder is supposed to be out to meet with us this week. I loved the previous post, a garden in every yard, indeed! And chickens too! I live on the very edge of town, and am a little sad that even tho my backyard is in the boonies, I still can’t have chickens! None in city limits… wah! Such pretty, pretty girls! Building on Mia’s question above…what does one DO with a guinea hen? We’ve got some at the farm sanctuary I work at, but all they seem to do is run back and forth along the fenceline, in kind of a caged-animal behavior. Do they lay eggs you can eat? Hi Hayden: They’re yard jewels with us. They can get their scratching fix in their coop; it never freezes in there! Emily: OMG NEVER in the greenhouse or the garden. They’d eat all the plants, and they would dig everything up; they are horribly destructive. On rare occasions they’ll manage to find a way in to the veg garden and I am still finding their damage in the form of scratches on my potatoes. Mia: I tell everyone that, if you have neighbors, don’t get guineas. We have two neighbors. Our second neighbors have guineas, so now our next-door neighbor has guineas in stereo. Here is my definitive guinea post. Robin: So exciting for you! Oh the fun you will have. They really are delightful. I have two girls whom I do “allow” to come into the garden with me: they have the sense to stick to the paths, and, if I am weeding, they stand somewhat patiently next to me while I hand them worms. Stacie: Boohoo for you! They are quite fun. I wonder why you guys can’t: considering chickens were common backyard fare some 60 years ago, some new law must have come into being in Tinytown. FDK: Well, they do lay eggs, on occasion. I have them because they’re great watchdogs and are keen to alert you if the hawk comes by. They’re such good watchdogs that they let us know if the bluejay comes by. But they’re better than roosters IMHO. Ohhh…thanks for the poultry eye candy! I miss my birds. I also just finished Little Heathens and wanted to say thanks for the recommendation. What an enjoyable read! Beautiful birds! I’m considering getting a couple of guineas just so we don’t have to have a rooster to free range at the new house. How loud do you think just 3 would be? Do yours roost in with the hens? Hi Angie! I am glad you loved that book. Did it make you think about your house at all? I liked thinking about how the families just got by during the Depression. Laura, if I remember the aerial photo of your home, I think you would be fine with three. They are loud but hey: this is the country! I think it is most important to raise your guineas with young chickens; some of the chicken habits will rub off. They really bonded with our Barred Rock, who, to them, looked like a big Mommy. The chickens and the guineas are about a month apart. And yes, they all live and roam about together just fine. Hope you’re still checking the comments! My grandmother told me that guineas (at least in Georgia) said “Patter-rack”. Kudzu, that sure sounds like a southern guinea to me! Hah. Actually, your grandma’s right. I always heard they say something like “buckwheat” but I sure don’t hear it. Hi Deanna! Aren’t chickens great? I think everyone should have at least 3.